Making it easier for patients to be healthy. We are a non-profit, multispecialty medical practice caring for 510,000 patients at 20+ locations around Boston. On May 15, 2014, Operation A.B.L.E. 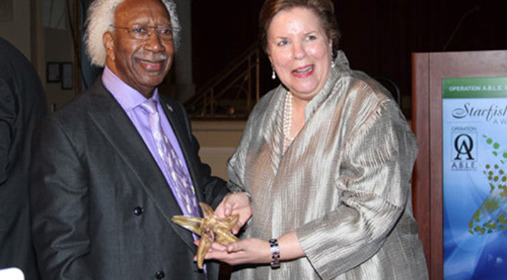 President & CEO Joan Cirillo presented the 11th annual Starfish Thrower award to Marvin E. Gilmore, Jr. Mr. Gilmore was honored for his lifetime service and achievements as a philanthropist, entrepreneur, visionary, musician and war hero. As with the Starfish Thrower awardees who precede him, Mr. Gilmore has made a difference in the lives of many! Atrius Health believes in developing and supporting the full potential of its diverse workforce in order to better serve a diverse patient population in providing outstanding medical care. 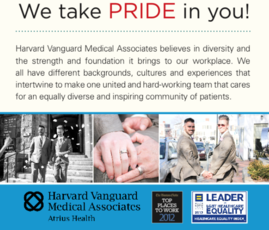 Atrius Health recognizes and values the unique skills, perspectives, characteristics and backgrounds that a diverse workforce has to offer in providing great medical care.